As of late, I have been inconsistent in blogging and I apologize for that (although I have been quite active on my dayre, hees). The reason was simple though, I was feeling very demotivated. It all began when I was preparing for my Japan travelogue, which took forever as just 1/2 a day in Tokyo was equivalent to 80+ pictures after cutting them down from 200+. A few days later, I was finally done with rearranging the pictures and was about to proceed with the detailed description, only to find out that Flickr had caused them to mysteriously disappear *flips table*. Long story short, I am back to square one and the thought of re-doing the entry upsets me. Then came the revamping of MFP. Change is good, but the hideously huge grey footer you’re seeing now is not; yet it is beyond my control. *SIGH* Good news is that MFP is working on it so I reckon it should be a gone in a week’s time.. ’til then, I shall get my blogging mood back. So let’s get started on my L’Oréal EverStrong™ Thickening hair regime! 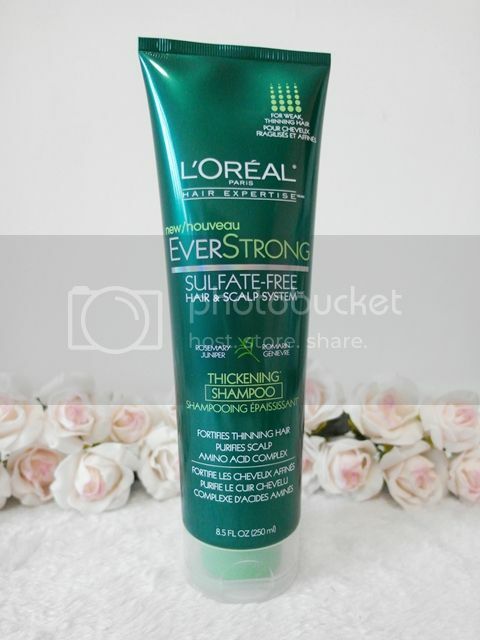 I have always been ranting on my fine hair woes – how flat and limp it is, how little hair I have as compared to my gfs with gorgeous thick manes.. so to be honest I didn’t really set high expectations when I first heard about L’Oréal EverStrong™ Thickening Sulfate-Free Hair & Scalp System. The main ingredients for L’Oréal EverStrong™ Thickening Sulfate-Free Hair & Scalp System are rosemary tint and romarin menthe, so I was expecting a reinvigorating minty hair wash when I first used the L’Oréal EverStrong™ Thickening Shampoo. Instead, I was treated to a very gentle and relaxing shampooing ever! The natural aromatic of rosemary tint and romarin menthe invigorate my senses instead. The shampoo lathers really well (a little goes a long way) and cleanse my oily hair/scalp thoroughly. 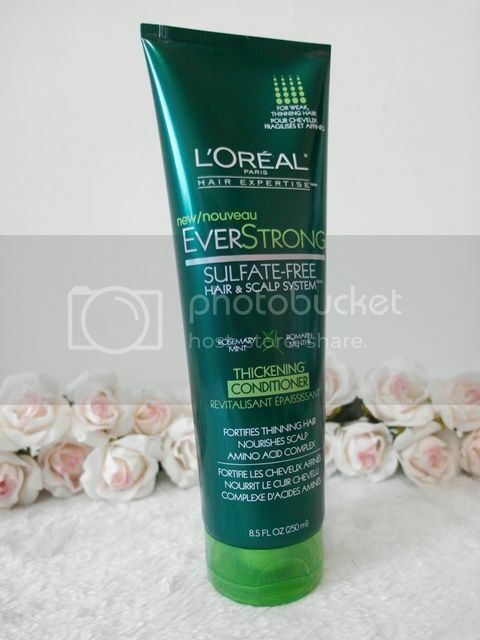 Next up, L’Oréal EverStrong™ Thickening Conditioner was used to soften and detangle my hair. I noticed that it is very light and doesn’t weigh down my hair despite making my hair much more manageable than before. My hair was left feeling amazingly soft! 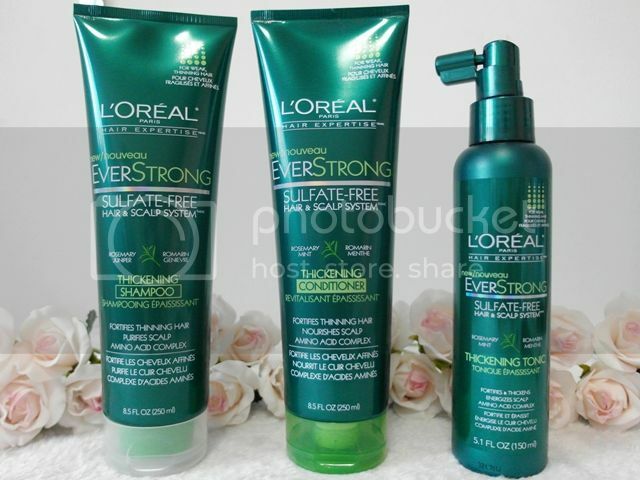 Here’s presenting you my favorite product in this trio – L’Oréal EverStrong™ Thickening Tonic! I’d first received the tonic in Black Box One Year Anniversary Party and had been using it religiously ever since. 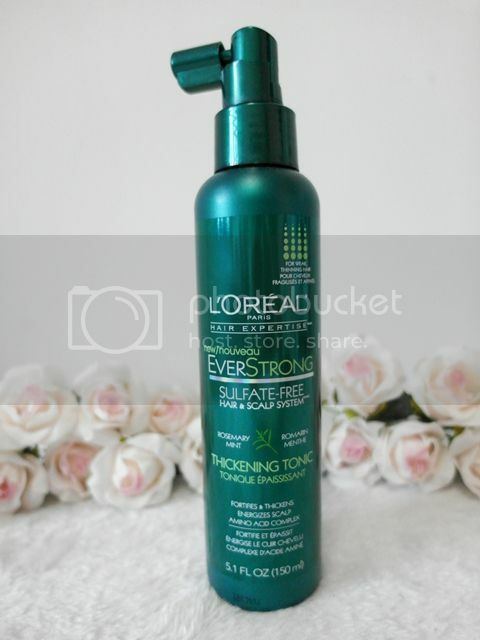 For hair that needs extra strength and volume, EverStrong Thickening Tonic helps the scalp feel energized whilst deeply penetrating the hair fiber to help promote stronger hair that looks thicker and denser. It was good on its own, and even better when used with the entire L’Oréal EverStrong™ Thickening Sulfate-Free Hair & Scalp System. I tend to spray it on my roots, massage my scalp before wrapping my hair with a towel for 5 minutes as I believe it helps aid in better absorption. Then, I proceed to blow-drying my hair for an instant thickening effect! Previous Post Get Active with May’s Bellabox!